Anyone out there who has read Eat, Pray, Love (which is another way of saying “everyone”) will understand how honored I am to present an official DALS Q&A with author Elizabeth Gilbert. Like the rest of the world, when I read EPL, I remember asking myself, How could someone be this likable? Well now we might know at least part of the answer to that question. 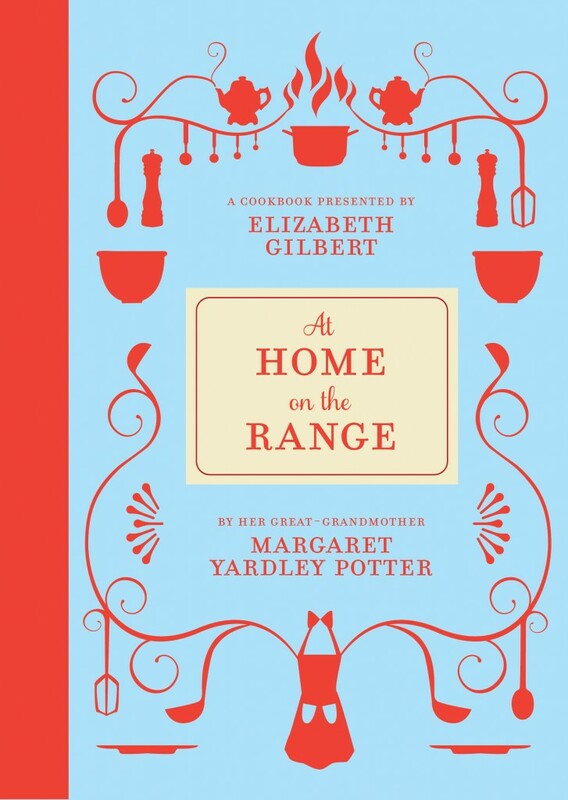 This month, she is reissuing a cookbook, At Home on the Range, written in 1947 by her great-grandmother — Margaret Yardley Potter, aka “Gima” — that makes the source of Gilbert’s warmth and wit abundantly clear. Gima’s cookbook had always been part of the family lore, but Gilbert had never actually read the thing until last spring when she discovered it at the bottom of a box. “I cracked it open and read it in one rapt sitting,” she writes, in a new introduction. “Well, that’s not entirely true…After first few pages, I jumped up and dashed through the house to find my husband so I could read parts of it to him…The humor! The insight! The sophistication!” Gima was, as Gilbert told me, “a giant character,” born into wealth, but saddled by a bad marriage and a struggle with alcoholism that would eventually kill her. This, however, did not stop her from writing a cookbook, writing a column for the Wilmington Star, and becoming a way-ahead-of-her-time forager, adventurer, and the kind of foodie that would make Brooklyn proud. Liz talked to me a little about what reprinting the book meant to her. Jenny: I’m so glad you have released this cookbook because it gives us an excuse to ask you about your own dinner table. So what is it like? Do you sit down with your husband every night? Elizabeth Gilbert: It is definitely a Gilbert family institution. When I grew up, dinner hour was sacred. All the manners I ever learned were taught at the table. (I get a warm flush of joy when I’m at someone else’s house and one of their kids says, “May I please be excused?” I’m like, YES! You are ready for life on earth! ) In my own house, dinner is the best hour of our day. I always say I didn’t marry a Brazilian, I married an old Italian woman. My husband cooks slow food. Sometimes he starts at 4:00. We put on NPR, he opens a bottle of wine, and while he’s cooking a stew, I’m getting housework done or working in the garden just outside the kitchen. Then we eat. At dinner we have lots of time to go through cookbooks to see what should happen tomorrow. JR: All I kept thinking while reading this book was that today, Gima would be editor in chief of Real Simple. She is just so organized in the way she thinks about cooking. Every chapter in here addresses tackles the same things I’ve been writing about: What you should have in the fridge for emergencies (boiled potatoes, eggs, caviar!) how to entertain, how to plan ahead for a weekend at the beach, what to bring a sick friend in the hospital. EG: She was so ahead of her time. If she wasn’t the editor of Real Simple, she’d have a food truck or she’d be celebrity female artisanal butcher or she’d own a pickle factor in Brooklyn. Other than maybe the food allergies and the veganism she’d be totally on board with everything going on in the food world today. JR: Why was it important to you to get her book out there again? Was it to get her the exposure you felt she deserved? Or was it more personal? Or both? EG: I published At Home on the Range as a literary treasure above a culinary treasure even though it’s both. Gima’s voice was so compelling to me. I knew forever that the book had existed, but I dismissed it in that youthful way — you know, oh everybody’s Grandma cooked — and it wasn’t until I sat down and read it last spring that I felt like I had really met her. She was so alive, so present. Such a natural writer! Just a giant character. I wanted people to hear that voice because it was not what I expected. She was way more Dorothy Parker than Betty Crocker. JR: But you also published it because the recipes hold up, right? Which is kind of amazing considering it was published over 60 years ago? EG: Yes. I’m not personally a cook. I mean I can cook and I enjoy it, but for the last decade I’ve turned the kitchen over to my husband. My chops are pretty shaky. I can make a nice risotto — but why would I when there’s an artist who really wants to do it? But anyway, for the last two months we’ve been cooking from Gima’s book and my admiration for her has now quadrupled. We’ve second-guessed a lot of her recipes because they don’t feel right. Like when we made her Chicken Cacciatore. Both of us looked at the recipe and said, this is going to be bland. We wanted to do other stuff, like add more liquid so it would be stew-ier; we wanted to add olives and mushrooms. But we made this pact. We wanted to do her recipes precisely as they had been written. So we did and it was stupendous. I can hear Gima laughing. You think I don’t know how to make Cacciatore? I’m just now learning to always believe her. Like her recipe for tea cookies — it was already over a hundred years old when Gima discovered it and the ingredients looked so boring. But the result is a cookie that isn’t too cloyingly sweet, and so beautifully simple. JR: The Pea Vichyssoise looks pretty amazing, too. EG: It is! I’ve been lucky because there have a been a lot of food events around this cookbook and a chef in San Francisco made that for one of them — it was fantastic. EG: My cousin Alexa Potter, who now writes a weekly blog about Gima’s book, used to work for the Library of Congress and she found out that it sold about 3,400 copies, which for a regional author is pretty great. But Gima could have been so much more if she hadn’t been hampered by the chaos of her personal life — the ups and downs of her marriage, alcoholism, constant bankruptcy, moving every year to a different house. Had her life been more stable, or had more “good orderly direction” as they say in Alcoholics Anonymous, she could’ve produced a great deal more. JR: Do you think she would’ve gone to Paris and achieved all that if she had read Eat Pray Love? EG: This is what I think about all the time. Especially as a woman, I think we all feel that there is no other place or time in which we’d want to be born. But I have been the beneficieary of all the liberation that came 10 to 15 years after she died, raised in world of infinite possibility, and able to live out what she didn’t get to live out. I had permission to leave a bad marriage, and go to Europe and eat my way through my troubles but she didn’t, even though it sounded like that was exactly what she wanted to do. It sends a shudder through me when I think of the lost opportunity and squandered talent. I think of her France dream as a narrow escape that she narrowly escaped. But to answer your question, forget reading Eat Pray Love, I just wish she was here so I could buy a plane ticket and take her to Italy or Portugal! She’d be such a great travel companion. On the other hand, I feel like when she died, she ended up fragmented into a thousand pieces living through all of us. So in that way, she did go to Europe. JR: Any final words besides to make the pea soup? EG: Yes, don’t make the same mistake your grandmother made — buy this book! It only took 65 years, but everyone has finally caught up to where Gima was in 1947. JR: Thanks Liz! I’m going to wrap this up on my end with a few words from Gima herself. She was a woman of strong opinions and I was amazed to find that most of her tenets for good living would hold up today. Here are a dozen of my favorites, but there is one on every single page. There is no substitute for either good food or a comfortable bed…Don’t rush the purchase of either purchase, for these important articles, like a husband, should last a lifetime if well selected. Sea air makes for hunger. Providing a really heartfelt welcome and simple and plentiful food gives any hostess an advantage over the famous man who built the better mousetrap. A world of friends will beat a path to your door. If the directions for [pizza] seem vague remember that this is a dish as happy-go-lucky as its originators in their pre-Mussolini days. Fingers and finger bowls are the only utensils devotees demand for the enjoyment of [mussels] with perhaps a thick slice of warm French bread for post-operative dunking. Cold beer is the drink with oysters and the true Eastern Shore roast-oyster addict doesn’t want his attention distracted from the business in hand by any foolish side dishes of vegetables or salad. I can’t believe that writing deathless music or painting a really fine picture can give any greater feeling of artistic creation than gazing on a beautiful golden loaf for which you are completely responsible. The very best present you can give a sick friend is a bit of yourself. Two short cheery visits are better than one long wearying call and even the most lonely sufferer will feel cheered and popular if you flatter her by phoning ahead to make an appointment. The best party menus are simply favorite family dishes with the quantities doubled or tripled. The relaxed mind that follows a lavish platter of some cheap but delicious stand-by is better than the jittery condition that too often accompanies a skimped expensive novelty that should first have been tried out on a patient husband and then had the directions written out. Any host worth her salt should be able to remember what her friends can’t or won’t eat, and as for the thing they like, show me the woman, or particularly the man, who isn’t able to go to town with a favorite food almost indefinitely, while specialties of the house are always looked forward to, no matter how many times they have been served before. Dashing members of the Tuesday luncheon and bridge club may relish a sweet weak cocktail with trimmings that resemble low tide at Coney Island, but a true bon vivant prefers the bouquet of his liquor unspoiled. If you have butter, use butter. I love the fact that Elizabeth Gilbert and her husband cooked her grandmother’s recipes without changing anything and were surprised by the outcome. Oh, I love the idea of someone gaining access to a long gone relative in this way! It’s like finding a long lost box of letters. Only better because she was really trying to communicate, in a holistic way, on topic she was passionate about. I wish we could all have that kind of access to our grandmothers. I’ve got one single picture of my paternal grandmother, who died long, long before I was born. If I could find something she wrote, I’d feel like I’d won the lottery. What a great project. Great interview Jenny. The list of quotes that you pulled from the book are remarkable in and of themselves – can’t wait to read the whole thing! You are the best. I hope that husband of yours appreciates how lucky he has it. Cook book just purchased. It sounds like a charming little book – it reminds me of Edna Staebler’s Food That Really Schmecks, about Amish cooking in Waterloo County, Ontario. I’ll be sure to pick this one up. EG seems lovely! I just went on an Elizabeth Gilbert binge, reading 3 of her 4 books in a row. Loved them all. And now this one! Yay! I’m Alexa, the former historian for the Library of Congress, actually. If you go to the McSweeney’s-sponsored tumblr for At Home On the Range, you can learn more about our great grandmothet Gima and her life in my weekly blog post there. Great interview, can’t wait to get my hands on this cookbook (and your own cookbook, which is on its way to me as we speak)!